Bayek leaves reality behind in the second downloadable content release for Assassin's Creed Origins. Expansions for Assassin's Creed are always better the farther they sit away from the primary game. Assassin's Creed III's The Tyranny of King Washington, Assassin's Creed IV: Black Flag's Freedom Cry, and Assassin's Creed: Syndicate's Jack the Ripper stand as the best downloadable content (DLC) releases in the franchise and all of them diverge significantly from their core entries. More of the same is fine in some cases, but Assassin's Creed DLC excels when it's different: a new perspective on what was done before. The second DLC for Assassin's Creed: Origins, The Curse of the Pharoahs, is doing what it can to sit alongside the entries listed above. The previous DLC release, The Hidden Ones, was extra content for the existing game: a new region, some new gear, and a bump in the level cap. Curse instead leaves behind historical accuracy for a new supernatural storyline. And I'll be damned if it doesn't work. It's been a few years after the end of Assassin's Creed: Origins and Bayek is on a mission to obtain another Artifact of the Ancients. 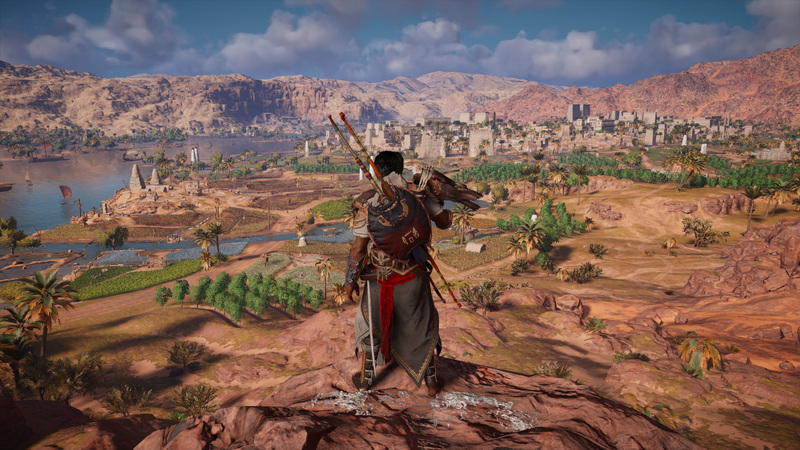 Bayek travels to the southern city of Thebes, gets his intel, and goes about retrieving the item. What he ultimately finds is a much bigger adventure than originally intended. You know what to expect from the real world of Origins. The starting map in the Valley of the Kings region doesn't feel much larger than the previous expansion region of Sinai for The Hidden Ones. Thebes itself is a particularly large city, with beautiful lotus ponds and exorbitant architecture that rivals that of Memphis and Cyrene from Origins. (Alexandria is still the largest as far as I can tell.) It's also home to Karnak and Luxor, two huge temples that are probably the most ornate structures in the game period. Despite the size and obvious care put into the five regions of the new world map—Thebes, Thebes Nome, Theban Necropolis, Valley of the Kings, Yebu Nome, and the Waset Desert—the look is what you've come to expect in large part from Assassin's Creed: Origins. Oases, deserts, and mountains comprise most of the landscape, while settlements, farms, and forts punctuate the overall map. There are highlights, but not much you haven't seen before if you played the base game. That is until you get a bit further into Bayek's adventure and the Valley of the Kings region. Here there are several tombs that work differently from the tombs players have become use to. 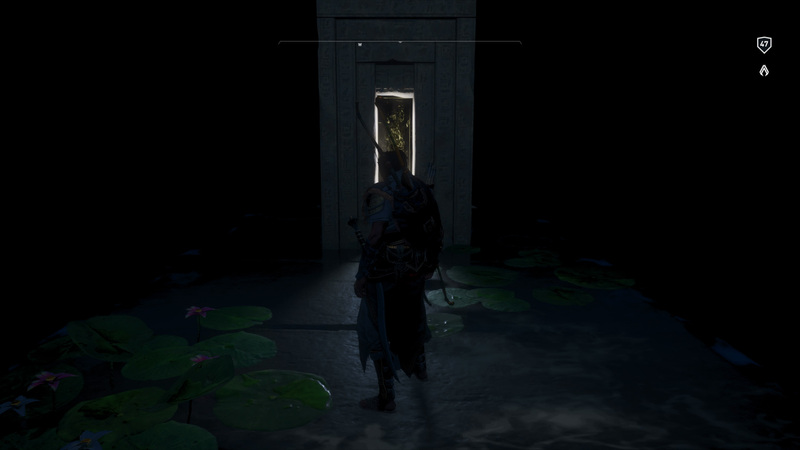 Each tomb holds a gateway into another reality, a glowing door that transports Bayek to different versions of the afterlife. 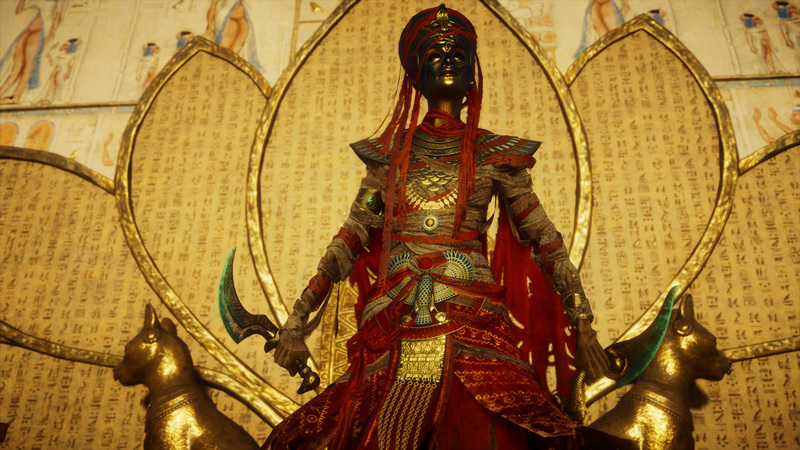 The Tomb of Nefertiti is the first one you'll dive into and it takes you Aaru, which shows you everything that Ubisoft's artists are capable of when untethered from things like "reality". Aaru is the resting place of souls that did good in their lives, an ocean of golden grain waving in the gentle breeze. (The Field of Reeds previously mentioned in Origins.) The souls of the dead "live" well and drink wine. Ships sail on the grain itself and mythical creatures roam the countryside in search of those that are... not having a good time? 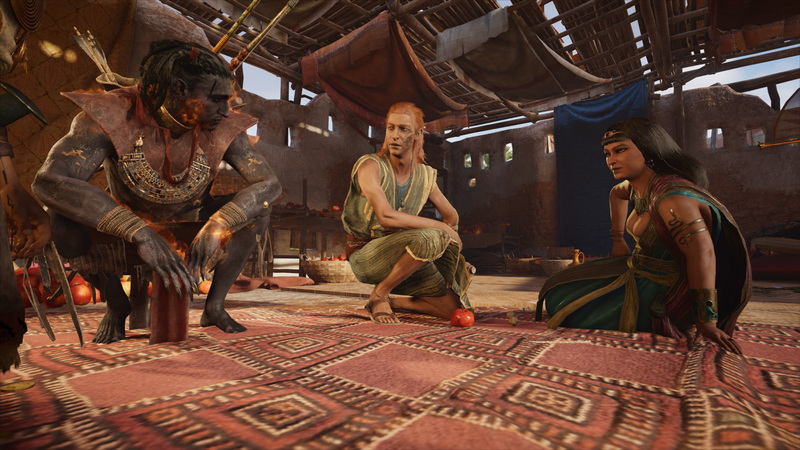 Giant scorpions, cryptic talking birds with the heads of ladies, and jackal-head guards protect these environments, attacking those that don't belong, like Bayek. Each afterlife has a different theme, and a unique series of quests related to the idea behind that afterlife. The doorway in Tutankhamun's tomb leads to Duat, the place that the Hidden Ones send their targets, a rough analog to Purgatory or Hell. While Aaru is a place or light and calm, Daut is a landscape of starlight, perennial darkness, and giant, ethereal lotus blossoms. The afterlife of Aten is centered around a burning ball resembling the sun, while the region itself is a grand temple floating on a vast lake. Each and every single afterlife has its own distinct look and feel, giving players a grand new vista to look at as they explore everything Curse has to offer. The sun hangs high in Aten. It's as if, following the release of the historical Discovery Tour mode, Ubisoft let itself free from the shackles of history. The afterlife regions are simply stunning and the quests therein offer some meaningful stories. Origins' quests were already well done, but some of the ones available here are a cut above, offering a unique glimpse into Egyptian mythology. The only thing I really feel is missing here is a revisiting of characters from Bayek's past; instead, Curse is concerned with all-new characters. The impetus for Bayek's journey to the afterlife is the eponymous Curse of the Pharoahs, which causes ghosts called Pharoah's Shadows to spawn around the world at random. These shades hunt and kill everything around them at random and while you can fight them, you can't kill them. Eventually they'll disperse in a cloud of smoke and sand. They're almost like the Phylakes in the base game, except they lack a persistent presence in the world. Does this guy know he's burning? The afterlife areas are the key to defeating the Pharoah's Shadows, as each of them are actually glimpses at the boss fights that stand at the end of each region's quests. Each Shadow can be fought and killed at the culmination of their region, offering you some unique Legendary weapons. Each one is well-worth the adventure. Killing these bosses also kicks off a system that is exactly the Phylakes; Anubis Shadows are high-level jackal-headed soldiers that wander the real world and try to kill Bayek on sight, a repurposing of an older mechanic yet again. The Hidden One did the same and while I like the overall idea, doing it again feels like spinning in circles. Repeating concepts like the Phylakes holds the DLC back a bit, but it doesn't ruin the overall experience. The Curse of the Pharaohs is what I wanted from Assassin's Creed: Origins downloadable content. The Hidden Ones was fine an expansion of what came before, but Curse really blows the doors out on trying something new with the concept. Assassin's Creed has to be tied to some form of reality, but the DLC has room to play and Ubisoft should use that room more often. I had a blast with Curse of the Pharaohs and it sits as one of the better DLC releases for the Assassin's Creed franchise, let alone this specific entry. 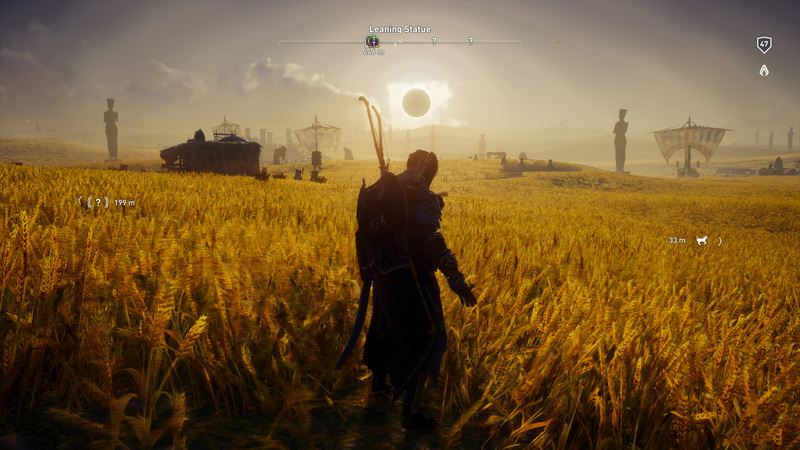 Bayek heads to Thebes to retrive another lost artifact, only to find himself taking a trip into the afterlife. The base map for this expansion seems about as big as the Hidden Ones expansion, but the additional afterlife regions add scale and scope to this DLC. The regions also untether Ubisoft's artists from reality, allowing them to come up with some grand vistas as a result. 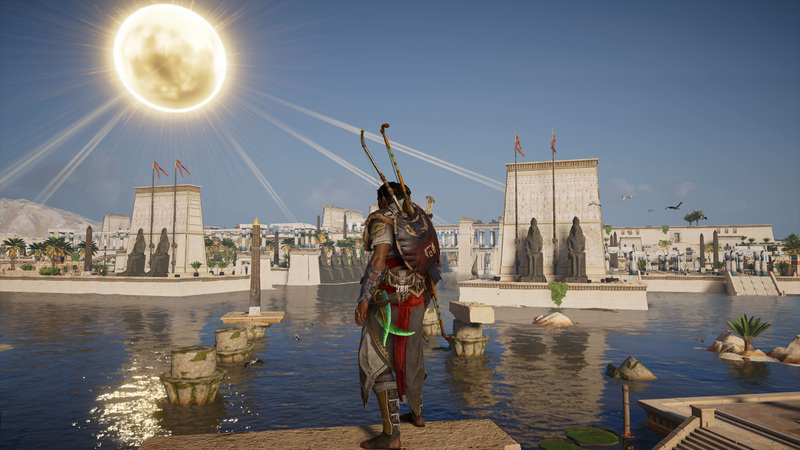 Curse of the Pharaohs is what Origins needed and stands as one of the better expansions for an Assassin's Creed game. Tagged with DLC,	PC,	PlayStation 4,	Reviews,	Ubisoft,	Xbox One.